Welcome to Seaport Marine Insurance Services, LLC! Seaport offers a Online Cargo Program which provides complete Cargo Insurance Coverage for Ocean, Air Shipments, allowing exporters, importers and forwarders to insure their cargo shipments any time, any where in the world. Register your company with Seaport Marine. Please advise if you are a Freight Forwarder, Importer or Exporter. 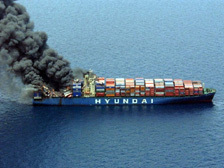 For security purposes, we will then email you your Cargo Insurance Rates that will be in effect. If our rate is acceptable to you, we will email you your User ID. Start insuring your shipments online. The Seaport Marine Insurance Group is one of the foremost professional cargo marine insurance brokers in California. We take pride in our providing the client with great rates, coverages, and a quick turnaround. If you are shipping vehicles overseas, importing or exporting general merchandise, we are ready to give your professional liability the attention it deserves. If you need the expertise of one of our brokers or have questions about our firm, spend some time looking around our site then contact or email us at seaportinsure@gmail.com. Although applications are required for binding, indications of annual premium can be provided all within 24 hours! Depending upon the type of cargo , we will place your coverage either thru the London or American market; either way, you will be assured of outstanding claims service and professionalism.